‘No fear, no pain’ is the mantra used by the Australian Livestock Exporters Council (ALEC). Yet the 60 Minutes investigation into live export negligence in early April shocked the nation, prompting calls for the brutal trade to be banned completely. More than two thousand sheep died onboard the Awassi Express last August during an intense heat wave en route to the Middle East. Footage of livestock covered in filth, gasping for air and fighting for space will be forever etched into the mind of every Australian viewer – view here. Many of us don’t often think about the plight of livestock onboard live export ships. In fact, many of us don’t really know what happens to them at all. We would prefer to imagine them frolicking freely onboard the ships, smelling the fresh ocean air, and being blissfully unaware of what’s to come. That idealistic image couldn’t be further from the truth. So, what really happens to livestock when they leave Australian shores? Aimee Weir, spokesperson for Adelaide Against Live Export (AALE), has in-depth knowledge on the issue. Armed with a growing group of volunteers, AALE work tirelessly to create public awareness of the negligence of the live export industry. Since 2014, AALE have monitored the process of live export: from the farm, the feedlot, and then the trucks to the ships – taking countless hours of video footage to report to the authorities. Mrs Weir said the ships that depart Port Adelaide are extremely old and were initially designed as car carriers. “They’re simply not equipped to have livestock onboard. The animals are housed in really cramped conditions; they have to stand for the entire journey, and there’s certainly not enough room to lay down or move around,” Weir said. With one ship being able to carry up to 75,000 animals, many are unable to access an adequate supply of food and water. On a journey of up to five weeks, the weak livestock will inevitably die. “The weak ones will die a slow, prolonged, cruel death. They’re not going to have a humane death,” Weir said. Weir also commented on the lack of ventilation and the severe heat stress inflicted upon both livestock and crewmembers. “Coming into winter, we watched the Bader III load in Port Adelaide. It arrived in Israel in 45 degree temperatures. It puts so much stress on their bodies.”. Supporting this claim is PETA’s Media Officer, Emma Hurst; she says the livestock suffer from cramped conditions, poor ventilation, and heat stress. “The animals are prodded, kicked, and herded onto crowded, filthy, multi-tiered, open-deck ships and forced to stand for long periods of time – in a sickening slurry of water, urine, and faeces.” Hurst said. What happens to livestock when they reach their destination country? Many Australians don’t know where our livestock is exported or what type of treatment they receive from the importing countries. According to the Australian Livestock Exporters Council (ALEC), as an island nation, Australia utilises air and sea transport to move livestock to destination markets. Kuwait, Qatar, Indonesia and Vietnam are the largest live export markets, valued at a total of $1.4 billion, despite suffering a forty percent drop of live exports in the last decade. ALEC claims to accept the responsibility of ensuring the welfare of slaughter/feeder livestock through to the point of slaughter. “That means Australian exporters, even after animals are discharged and sold, continue to trace animals, train staff and upgrade facilities along supply chains to the point of slaughter,” ALEC says on their website. 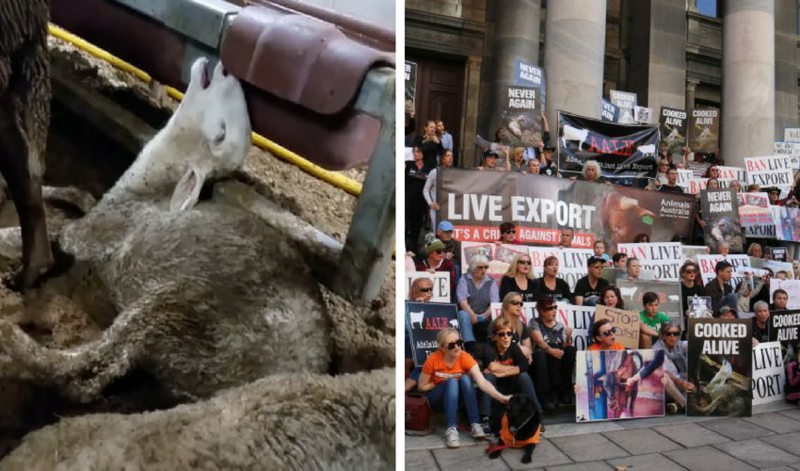 Despite these claims, the live export industry has endured severe controversy and countless scandals over the past decade. According to Emma from World Animal Protection Australia, Since the Department of Agriculture created the Exporter Supply Chain Assurance System (ESCAS) in 2012, there have been nearly 150 complaints of non-compliance. “Many of those that survive the journey are handled roughly at their destination and killed while fully conscious. Too many suffer outright brutality,” she said. The reputation of the industry has diminished due to media reports of breaches of animal welfare, both in Australia and overseas, including a 2011 Four Corners investigation into the treatment of Australian cattle, and a 2006 Animals Australia investigation into Egyptian slaughterhouse malpractice. PETA’s Emma Hurst says that the Australian government has had ample opportunity to create meaningful action. “A 2011 exposé by Four Corners revealed that the eyes of Australian cows exported to Indonesia were gouged out, and their limbs were cut open while they were still conscious. A joint investigation in 2006 by PETA and Animals Australia documented that workers in an Egyptian slaughterhouse stabbed Australian cows, gouged their eyes out, and disabled them by slashing their leg tendons,” Hurst said. “After every high-profile incident politicians have expressed concern and then taken no meaningful action at all”. Does the industry has any control over slaughterhouse malpractice in foreign importing countries? AALE’s Aimee Weir certainly doesn’t think so: “There’s no way we can have eyes on what’s happening to our animals once they reach their destination country,” she said. “No matter what the Australian government says, we have absolutely no control over what other countries do. We simply don’t have the legal jurisdiction”. It’s reasonable to say that Australians are out of touch with the live export process. “The live export industry operates on a lack of transparency; it’s completely hidden from the public,” said Mrs Weir. “In terms of factory farming and live export, the common person thinks Australia has high welfare standards for animals – it couldn’t be further from the truth,” she concluded. Looking to the future, Emma from World Animal Protection believes the live export trade isn’t the only option for the Australian meat industry. “We’re calling on the government to grow the more humane chilled and frozen meat industry in place of live export,” Emma said. “Transitioning to the chilled meat trade would ensure that animals are slaughtered and processed in Australia under our regulations, and protected from arduous sea voyages and inhumane slaughter overseas”.